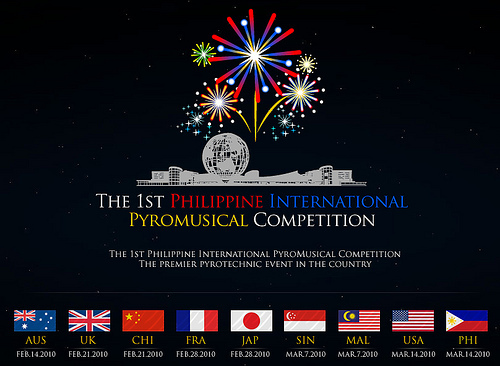 as a fireworks addict, I alway make it a point that if there were pyrolymics event, I should be there… :-D. Thus, when this event was initially announced to be held in November of 2009, I felt quite sad ‘coz I was engaged to work (Store Opening Gallore…wheeww). Fortunately the event was moved to February and March of this year (Thanks! thanks! thanks!). Of course together with my fave tambay buddy plus our cool baby (pilentz… :-D), we drove straight to MOA to watch the event. We weren’t able to witness the first presentation night held on Valentine’s day coz we were in Clark for another fantastic experience ( Watched the HOT-AIR Balloon Festival).Furthermore, we manage to watched the succeeding schedules. While watching, I felt as tough my life clock really stopped (Exage….whe…) It facinates me every time I watched them bursting in the sky of dakness. Different colors, styles, sizes and uniqueness were being witnessed. People were amazed while simultaniously utterring the word ” oh..wow”. Categories: event, experience, life, momment | Tags: beautiful light, competition, fireworks, fun, great, nice, pyrolympics, pyrolympics 2010, sky | Permalink. At ‘di ako pasiga-siga sa lansangan. ‘di na makahambalang parang walang pakiaalam. Humihinto ako kapag ang ilaw ay pula. At ‘di nagtatago sa ilalim ng puno. ‘Di ako nagkakalat ng Basura sa lansangan. ‘di ako gumagamit ng bawal na gamot. O kaya’y tumatambay at sa eskwela’y di pumapasok. Ang boto ko’y aking pinahahalagahan. Pinaglalaban Kong ang Dangal ng bayan ko. Sinusunod ko ang kanyang mga alituntunin. Categories: experience, feellings, life, song | Permalink.